I hope everyone had a fabulous weekend and stayed cool! I know I did! I can't wait to tell you about this weekend's project! Since I work at a home decor store on the weekends, I find myself being super productive before and after my shifts so I don't feel like all I do is work. 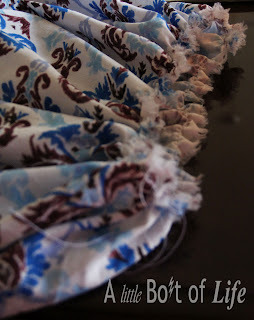 So of course, my first order of business (being productive of course) was to do some pinning on Pinterest. I found a dress that seemed easy easy enough to make (since I am now a professional seamstress!) so I thought I would make my first dress without the help of an experienced sewer (mom) by my side. ANYONE can make this dress. If I could do it unsupervised then so can you! You can read a more detailed tutorial at A Small Snippet (she even shows how to make a short version for those of you not in to the maxi dress), below is my version. First, (and probably the most difficult part of the dress) is picking your fabric. I always have a hard time with this. What if I hate the fabric I picked after I see it in dress form? I was with the husband who gave me a 5 minute maximum (what is it about men and a fabric store? I go into sport memorabilia stores without complaint!). I found one fabric I liked right away but decided to look around to make sure there wasn't anything better. After my time was up, I was still holding the first fabric. Even the husband thought it was the best we've seen. He might complain about being in a fabric store, but he at least will tell me what is ugly and what he likes. He and I both agreed the first fabric was the one! See, I told you this was the hardest part! For the top, you just need a tank top. I knew I was running low on time and husband's patience, so I decided to go with a tank top I already have at home. I was going to do white, but since my fabric had a white background I decided I wanted something darker. I went with the combination you see below. I wasn't sure about the dark blue with the royal blue and white, but I ended up really liking it! The next thing you need to do before sewing, is cut the bottom off your tank top. I wanted my dress high wasted so I cut off most of the bottom. Put your tank top on and decide where you want the waist of the dress. Then cut from there. NOW it's time to sew! I got 1.5 yards and wrapped it around myself 1.5 times. I ended up not having to cut any off so I wet right to sewing the skirt. With right sides together I made a basic stitch to sew the skirt together. Now you are going to turn your skirt inside out and insert your tank top (it should be right side out) with the shoulders going in first. You want the long seam you made in the first step to match up to the back of the tank top. I may or may not have messed this step up 3 times before getting it right. I kept putting the tank top in either inside out or backwards. My seam ripper and I got lots of bonding time. 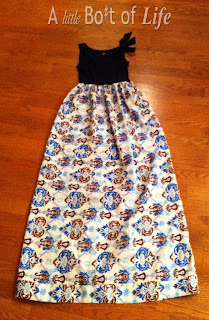 :) Once you have your tank top in the right position, pin and sew just like you did the waist. Now, just hem and you are done! If you have left over fabric, you can make a sash, but I'm more of a belt person so I just put a wide belt with it and Voila! I hope you have as much success as I did with this dress! I can't wait to see your renditions of such a fun and easy dress. If you struggle, you can ask me questions here or go to A Small Snippet as she has some tips and a more detailed tutorial. HAPPY SEWING Y'ALL! Today I am linking up with Still Being Molly for YOLO Mondays! this is SO COOL, missy! I LOVE IT. i seriously can't sew to save my life... i need a sewing machine and i need to teach myself. this is so awesome. 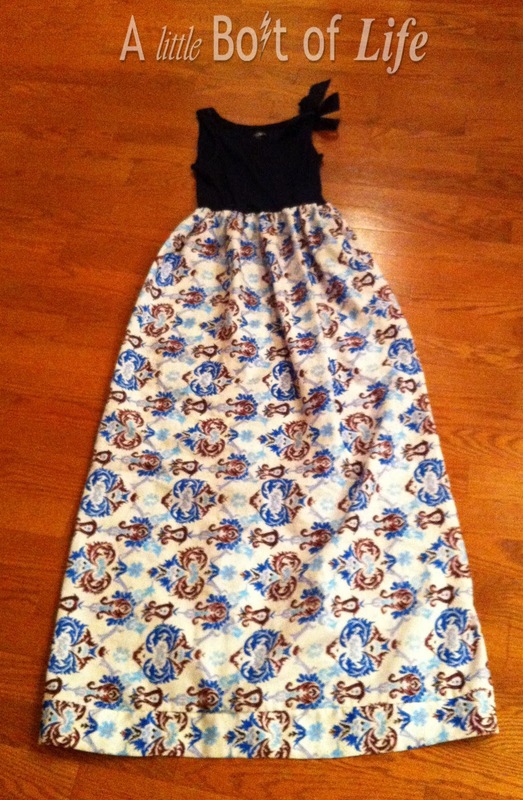 It turned out so well :) There's never enough maxi-wearing in my life! you really did a great job! and while it is hard to pick out fabric, you did a great job! i love the colors! that is such a great idea! Have to make it on my own! THANK YOU! visit my too, if you like! i love it!! ours are very similar!! love the pattern of your skirt! Thanks everyone for the kind words! Hopefully there will be more dress making in my future!